Gold Club Casino will then reward you with a bonus (Welcome Bonus is for new players only). The terms and conditions of the bonuses vary between different casinos and might also change over time and between different countries, so it is important to compare the different offers and read the T&C for Gold Club Casino before signing up. Gold Club Casino is an online gambling venue with a long-standing reputation dating back to 1997. The site was re-launched in 2018 as an improved instant play casino and it protects its whole website with the advanced SSL (Secure Sockets Layer) encryption, meaning that you are as safe and sound to play as can be! The site is offered in two languages – English and Russian. The colours the designers went for are pleasant and eye-appealing, the subtle nuances of black and blue will have you relaxed. You don’t want to look at a flashy screen while you’re playing for hours, do you? At this Curacao-licensed and regulated online casino you can revel in hundreds of amazing and immersive titles. All proven genuine and fair thanks to the Random Number Generator (RNG), the games at this online gambling venue are the ideal choice for all profiles of gamblers. Slot enthusiasts will likely have the biggest slice of the cake, as the majority of games come from Microgaming and NetEnt. That translates into an impressive portfolio of slots and progressive jackpots. Alongside those you can enjoy a litany of table games and live dealer games as well. There are well over 100 popular and hipster slots available for play at gold Club Casino. This casino’s clients prefer Microgaming and NetEnt slots over other providers, so if you are one to enjoy a game of Immortal Romance or Gonzo’s Quest, you will find your happy place at this online gaming destination. Far from saying that the two are the only ones to supply slots. You will also have a chance to enjoy some Play’n GO video slots as well, and some other manufacturers alike. In any case, you will find a slot according to your taste and preferences, be that your favourite genre, style of the graphics or provider. If you are here for table games, we assure you that you will love gold Club Casino’s table game offering. The opulence of titles has been divided into two sections, and both Blackjack and Roulette have their own separate lobbies that you can enjoy. To have a pick, simply click on their respective tabs and you will be presented with endless table game opportunities. Blackjack is available in many of its variants such as European Blackjack, Pontoon, Beat Me and Double Exposure. The realm of Roulettes has American, European and French Roulette, and La Partage in its orders. 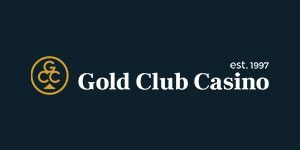 Gold Club Casino does not host any specialty or casual games such as lottery, arcade or scratch card games. This luxurious virtual casino has a well-established live casino lounge as well. Swarming with quality interactive titles, attractive croupiers and enormous wins, Gold Club Casino’s live dealer section is one to admire. A plethora of games are at your disposal, including Live Baccarat, Live Blackjack, Live Bet on Numbers and Live Roulette, as well as an abundance of their modern variants. International players will likely enjoy Baccarat Latin America, Baltic Roulette and Baltic Blackjack, and some Eastern Europe editions. All games are dealt in real time and according to the well-known traditional casino rules. To deposit financial means onto your Gold Club Casino account, you can use a range of banking methods. These include credit and debit cards (Visa and MasterCard), as well as electronic money wallet solutions Neteller and Skrill. No depositing fees are established for any of the mentioned options. All deposits are processed instantly. The smallest amount to deposit is 10€, whereas the maximum deposit is 5,000 EUR (with ewallets). To get your winnings you can utilise bank wire transfers, and the same cards and ewallets that we talked about in the depositing section. The least you can withdraw is 20 EUR (for cards), while the highest limit has been set at 10,000 EUR (utilising bank transfers). There are no withdrawal fees either. All payments will be converted into the only two accepted currencies at Gold Club Casino – Euros and US dollars. To get help and answers, feel free to contact Gold Club casino’s efficient customer service team. The friendly live chat lounge operates within its working hours – 8 am until 8 pm CET every single day of the week. A professional agent will reply to your instantly and resolve all your casino issues. If you prefer talking on the phone, you can give them a ring within the same business hours to 00 356 277 81 224 and chat your problems away. For general questions that you find someone else might have asked before, please consult the comprehensive FAQ list on the ‘Help & Support’ page. If you do not find a satisfactory answer there, you are more than welcome to send the team an email to [email protected], the casino’s customer service representative.